We promise to give you only useful information tailored exclusively for readers! Never miss another "to be read" book! DC Comics recently reset their entire universe and mythology of characters and relaunched all the series under the 52 banner/brand. 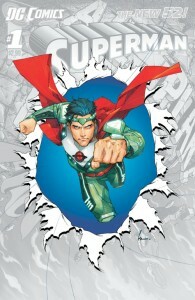 Bryan Young at Big Shiny Robot interviewed Scott Lobdell about Superman, his plans for the book, writing, and much more. You can read the entire interview at Big, Shiny Robot. Bryan Young: So, are you guys on this title for the long haul? Scott Lobdell: Well the last time I was on a flagship title I stayed on for about five years! So trust me when I say that I am totally committed to writing SUPERMAN for at least twice that long. SL: That would certainly make it more fun if we all got our assignments through musical chairs! The thought of Dan Didio with his hand on the arm of the Victrola as we all danced around waiting to leap on a cover taped to a chair…! But seriously, television series are launched all the time and either there are behind the scene changes or time slots moved or characters recast or shows are cancelled altogether. I think that DC, being at once nimble and determined to make adjustments throughout such a massive undertaking like the NEW 52, is a sign of the company’s strength and not a weakness. BY: So you have long term plans for the book? SL: I don’t work that way. Just like I could not have imagined a year ago that I’d be writing the world’s most famous super hero… I like the stories of the characters to mirror the same sense spontaneity and unpredictability that define us in “real life”. Yes, I turned in a twenty-five page pitch for the series that examined every aspect of Superman, his friends, his enemies, and over a dozen story ideas… but I’ve found over the years that the series often takes on a life of its own once the characters and the conflicts and the interactions start to show up on the page. Just imagine how boring it would be if you sat down and told me exactly how your life was going to play out every month for the next twelve months — who you were going to meet, what you were going to say, how they were going to act, what super powers you were going to use to defeat them? Then imagine the likelihood that your life would play out exactly the way you predicted it would over the course of the next twelve months. Sorry, but you must be logged in to post a comment. What else should you be reading? What If George R.R. Martin Wrote The Script for Star Wars 7? Books podcast spotlight – Speculate! Alexandria, Virginia is the most well-read city in America. What other cities are on the list? Beach Reads 2014 – The Definitive List of Lists! Quintessential Beach Reads From Years Past – That Are Still Worth Reading Today!